Preheat oven to 245 ºC (475 ºF). Place the red pepper on a cookie baking sheet and cook on high, in the oven, until skin blisters. Turn the pepper to ensure that the skin blisters evenly on all sides. Remove the pepper from oven, put in a bag or cover with cellophane and let cool. Peel and deseed. Meanwhile, melt butter in a large pan on medium high heat. Gently sauté the onions along with the zucchini and potatoes. Add the chicken bouillon, nutmeg and Cayenne and season generously. Bring to a boil and let simmer uncovered for about 20 minutes or until the vegetables become tender. Purée using a mixer or food processor. Add seasoning, if necessary. Keep hot. Crush the grilled red pepper with the cream and maple syrup to pulp. Reheat. 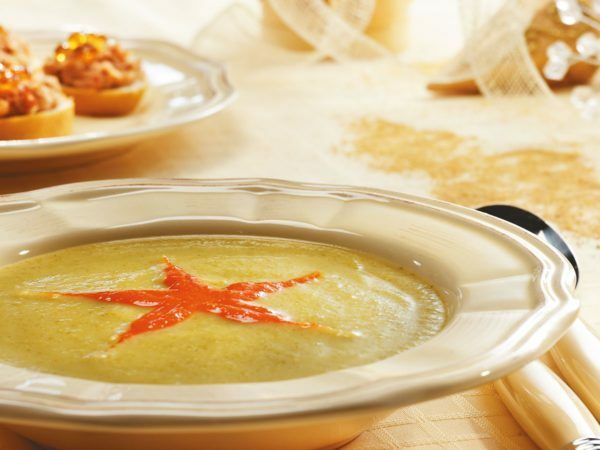 When serving, garnish the soup with the grilled pepper and maple syrup coulis. Open face sandwiches with maple jelly: Spread your favourite liver pâté, rillettes, duck confit, or cheese on slices of baguette or crackers and garnish with some maple jelly.A real treat! And quick to make!